Are you stressed out about taking your dog out for a walk? Do you dread seeing other dogs on the sidewalk? Does your sweet dog turn into a crazy, maniacal, barking, lunging, snarling dog when he catches wind of another dog in the distance? Do you feel nervous, anxious, scared and frustrated on the other end of the leash? You are not alone. Your dog is feeling this way too. Most leash "aggression" is your dog's response to his natural animal instincts. Animals have a fight or flight response to stressful situations. If a dog is in his natural state of mind- off-leash in a wide open space with the freedom to run and play to his heart's content- he will have the freedom to escape from something that makes him nervous. When dogs are on-leash, they no longer have the freedom to "flee" from a stressful stimulus so instead they have to "fight" and become defensive. Most people say that their dog is a different dog off leash and is well behaved around other dogs. Most likely, your dog is not mean and aggressive, your dog is stressed because he has no way to avoid a confrontation with another dog or person because he is stuck on a leash. For this reason, it's important that you do not label your dog as "aggressive". Instead, think of your dog as being "leash reactive", meaning your dog is reacting to an unnatural stressful situation. Leashes and sidewalks force dogs to approach each other straight on, which can be read as a challenging, aggressive approach. In a natural setting, if two dogs do not want to interact with one another, they would give each other lots of space by passing each other in a wide arc. Off leash, watch your dog interacting with other dogs and be aware of the distance that dogs give each other in passing. You'll notice that when dogs want to engage, challenge or play with another dog they will hold eye contact and approach each other head on in a straight line. In a park this is normal behavior, but on a sidewalk with leashes, dogs can not continue their interaction normally and they may become stressed. Stressed by not being able to run away, stressed by being choked as they lunge toward the other dog, stressed by your displeasure on the other end of the leash, and stressed by the inevitable tangle of leashes that can make dogs panic. For this reason, it's important to give dogs space and be very aware of body language. 2) Teach your dog the command, "look" so that your dog is comfortable with giving you a lot of eye contact. "Look" should be used to break your dog's fixation and to teach him to look to you as his protector when he is feeling distressed. 3) Really work on heel and loose leash walking so that your dog walks nicely on leash without any pulling or lunging to minimize tension. Choking caused by the collar and leash exacerbates the frustration and distress. 4) Outfit your dog in the appropriate apparatus, either a Gentle Leader or Easy Walk harness depending on the severity of your dog's pulling and barking. 5) Make sure that you have a hands free leash that snaps around your waist. This small change can make all of the difference because you won't be able to give your dog any cues by tightening up the leash when you see a dog. 6) Load up a treat pouch with two types of high reward treats like soft dog treats like dried liver, chopped chicken or string cheese that can be fed to your dog quickly and in tiny pieces. 7) Be very aware of your surroundings, your dog's body language and the distance that your dog can tolerate other dogs before a freak out. 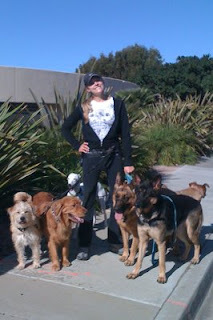 8) Practice sit/stays and "look" with your dog on all of your walks together. It's important for your dog to be in tune with you and mentally stimulated. The sit/stays will increase your dog's focus on you and will teach him to stay calm even with distractions around. You want to be able to tell your dog what you want him to do instead of leaving it up to him to react in the way that he naturally wants to. 9) Train your own brain to stay positive and happy whenever you see another dog. Lose all of the negative, frustrated, embarrassed, stressful feelings because your dog will read it all over your body. Force yourself to smile and use a happy voice with your dog. Shower your dog with praise and rewards whenever your dog is around another dog and behaves really nicely. 10) Be your dog's protector and build up your dog's confidence around other dogs. If you react negatively to the situation, you will only fuel the fire because your dog will think that the sight of another dog makes you angry with him. Your job is to create a very positive association for your dog with other dogs. Instead of thinking, "Oh no a dog! ", you and your dog want to start thinking, "Oh good a dog!". By rewarding your dog for good calm behavior and keeping his focus on you, he will start to associate other dogs with goodies. Your goal is for your dog to look at another dog and to look at you with a wag of his tail. Wouldn't that be nice?! Stay tuned for Part II of "Understanding Leash Aggression". We've just gotten started!